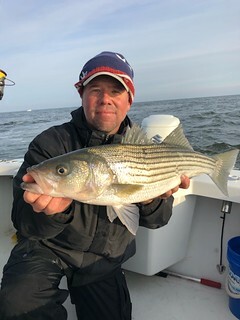 Trolling deep has been a popular option when fishing for striped bass this week along deep channel edges from 35 feet to 50 feet or better. The mouth of the Patapsco River has been one of the more productive places to troll in the upper bay. The deep edges of Swan, Love and Podickory points are also worth checking out. Umbrella rigs rigged with spoons or chartreuse sassy shads have been popular with swimshads, spoons or bucktails as trailers. This requires stout tackle as it takes plenty of inline weight to get everything down to where the striped bass are holding. Another option is to bottom bounce with a 12- to 14-ounce sinker on a twelve-inch dropper from a three-way swivel and a bucktail dressed with a twister tail or sassy shad on a six to eight-foot leader. One plays out line behind a slow-moving boat over likely-looking structure while lifting the rod tip up and down so the sinker “walks” along the bottom instead of dragging and possibly getting hung up. 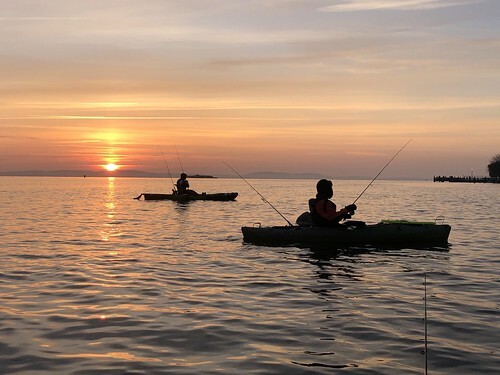 It is a tried-and-true method of getting lazy striped bass that are holding close to the bottom to bite. The Bay Bridge piers and rock piles are a good place to target; the fish will be deep and it will take a two-ounce or better jig to get to them, and that might not be enough if the current is running strong. Striped bass and large white perch will be mixed together at the deepest piers, the rock piles and the concrete abutments. 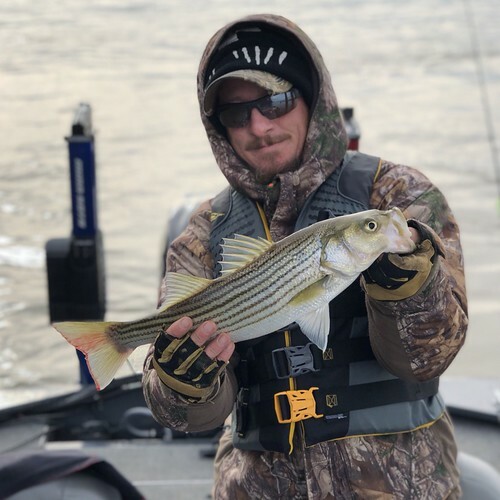 As the water gets even colder, striped bass will stack up like cord wood at the bases of the rock piles and abutments, and it is not uncommon to snag as many as actually take the jig since their metabolism is rapidly slowing down. Once the water temperature gets down into the lower 40s, the fish will stop feeding as it is difficult for them to digest their food. White perch have moved out into the bay and are holding in deep water. Once they are spotted on a depth finder they can be caught on bottom rigs or dropper fly rigs baited with pieces of bloodworm. The perch generally prefer to hold over hard bottom such as oyster shell. 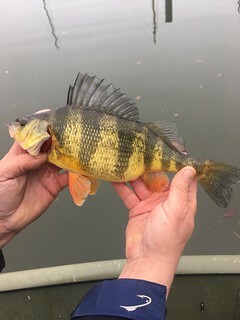 Colder water has urged yellow perch to move into the tidal rivers and they are providing some welcomed fishing opportunities. Small minnows are one of the best baits to use. Current surface water temperatures are about 50 degrees and the salinity is 4.5 parts per thousand, which is extremely low for this area of the bay – chalk that one up to all of the recent rain events. Trolling is one of the more popular ways to fish, especially if you have a heated cabin. The striped bass tend to be holding deep and getting them to bite can be a frustrating venture these days. It will not get easier as water temperatures continue to slide. Trolling deep with inline weights or downriggers to get umbrella rigs and single or tandem rigged lures down is now the ticket to get any action from the striped bass that are holding deep. The striped bass are holding in 35 feet to 50 feet of water. Umbrella rigs with sassy shads or spoons are popular with bucktails, swimshads or spoons as a trailer. 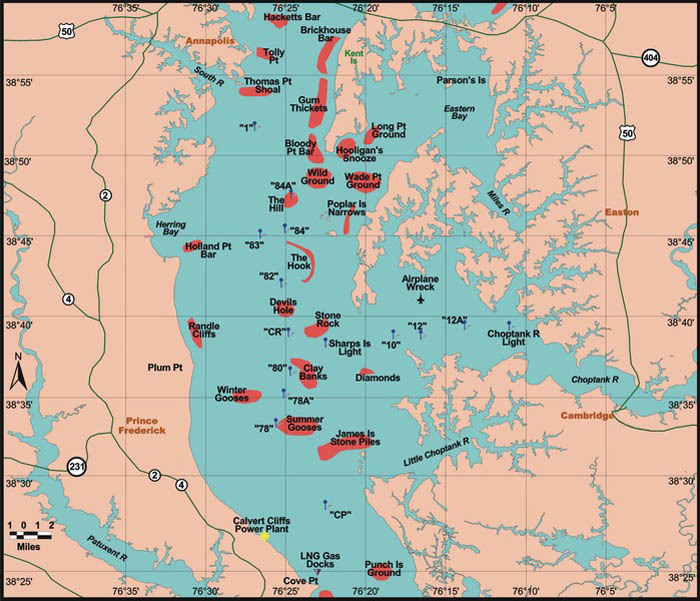 The deep channels at the mouths of the Choptank and Severn rivers along with the Eastern Bay and the western side of the shipping channel have been good places to give trolling a try. Bottom bouncing can also be a good option along channel edges. Light-tackle jigging is certainly a good option when fish can be spotted suspended deep along channel edges in the region. Large soft plastic jigs in the 6-inch size range will help target the larger striped bass. Using a good depth finder and understanding how to read it accurately are paramount to finding fish to jig on. Understand that there are other fish settling down in the same areas, such as gizzard shad and white perch. White perch have moved into deeper waters and now can be found in the bay channels or the very deepest channels at the mouths of the largest tidal rivers over hard bottom. Often it will take some lead to be able to hold bottom so a bottom rig or a dropper fly rig will be needed that is baited with pieces of bloodworm. The rewards are there in the form of some fishing fun and tasty fillets. Trolling is the most popular way to fish along the deeper sections of the region’s channels. It has been necessary to use heavy inline weights or downriggers to get lures down to where the striped bass are holding. Umbrella rigs are very popular this time of the year and most are rigged with chartreuse sassy shads or spoons with swimshads, bucktails or spoons for trailers. Tandem rigged bucktails and swimshads or single-rigged spoons can also be an important part of a trolling spread. Generally speaking the striped bass are holding in 30 feet or more of water – and often 50 feet and hugging the bottom. 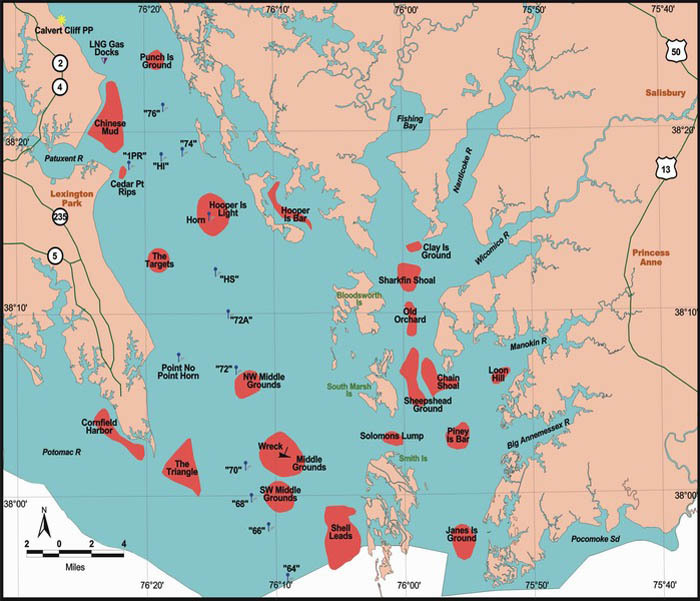 The sharp channel edge off St. Georges Island in the lower Potomac River and the mouth of the Potomac and Patuxent rivers have been good places to troll. The western and eastern edges of the shipping channel are also good places to search for deep suspended fish. There is still some breaking fish being spotted in the region, often on the eastern side of the bay. As one would expect the surface action is mostly 14-inch to 16-inch striped bass, but larger fish can often be found lurking deep underneath. Light tackle jigging is a good way to target these fish with large soft plastic jigs in the 6-inch size range. Skirted jigs are quickly becoming popular since the skirting gives a larger profile in the water. Jigging can be effective along any of the channel edges in the region, with the mouth of the Patuxent and lower Potomac being popular areas to find deep suspended striped bass. Currents in many of the larger trout management streams and rivers in the western and central regions continue to run strong, making for some difficult fishing. Typically the upper reaches of these waters recover much faster in regards to water levels and strength than the lower sections, so good trout fishing can be found there. There are still plenty of trout in the put-and-take areas and they can be targeted with small spinners and spoons when fishing with spinning gear. Fly casters will find good success with various nymph and streamer flies. 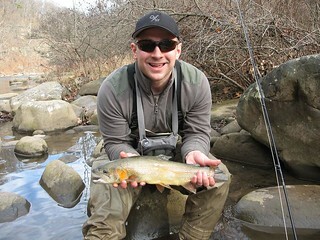 The catch-and-release fly-fishing-only trout management waters offer excellent opportunities. Fishing at Deep Creek Lake has been very good for a mix of walleye, yellow perch, smallmouth bass, chain pickerel and northern pike. The walleye and yellow perch can be found in relatively shallow waters along rocky shores and grass bed edges. Drifting live minnows along these edges is a proven tactic. A minnow jig combo is also another great way to work these areas close to the bottom. In the evenings walleye will move even closer along steep edges and casting jerkbaits is a fun way to target them. Northern pike can be found in the coves, often in transition areas where the water drops off into deeper areas. The current in the upper Potomac continues to be strong due to runoff from watersheds flowing into the river. 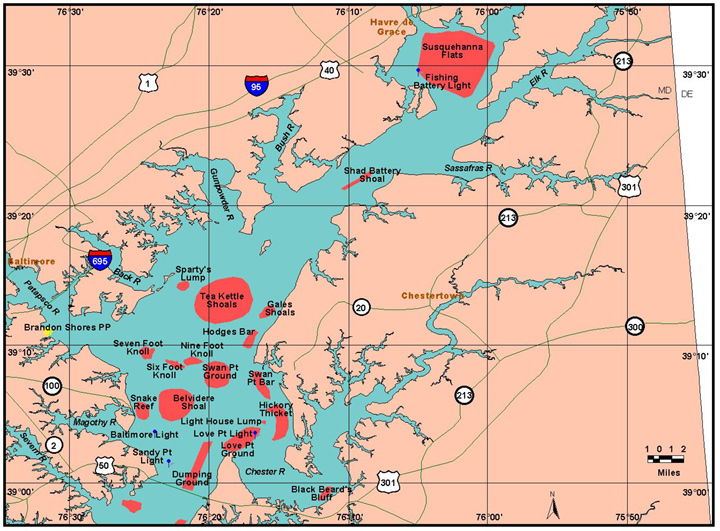 A recent fatal boating accident at Dam Four serves as a reminder how dangerous the upper Potomac can be. Photo by Sean Allen Sr.
Cooler waters mean good fishing for crappie as they tend to school up around deep structure. In lakes and reservoirs, fallen treetops, sunken wood are good places to fish. In some of the managed lakes, department staff have placed old Christmas trees that are weighted and sunk to provide habitat for crappie. In tidal waters, bridge piers, marina dock piers and rock offer great places to fish. The tidal Potomac in the Fort Washington and Wilson Bridge area is an excellent place to fish for crappie. A minnow or small jig set at the proper depth under a slip bobber is a proven tactic to catch them. Largemouth bass are very active in transitions zones leading to deeper waters often near sunken wood or similar structure. Spinnerbaits, jerkbaits and crankbaits are good options for fishing these areas. Working deeper structure with grubs, jigs and crankbaits that resemble crayfish is an excellent tactic for largemouth bass. Fallen treetops, sunken logs, rocks, bridge piers and dock piers are great places to target. Cooler water temperatures in the tidal rivers has caused channel catfish to be very active in all of the tidal rivers that flow into the Chesapeake. Fishing with cut bait, nightcrawlers, chicken liver or chicken breast that has been marinated in garlic or other favorite scents is also a great catfish bait. Blue catfish are extremely abundant in the tidal Potomac and can provide a lot of action. The medium sized ones make excellent table fare and freeze well. The Patuxent and Nanticoke rivers also contain expanding populations of blue catfish. Surf fishermen along the Ocean City and Assateague Island beaches are mostly focused on catching small bluefish. There are good numbers of these fish and they make fine table fare. They can be caught on bottom rigs with a float to keep cut mullet or finger mullet off the bottom and away from calico crabs. There are also some kingfish being caught on bloodworm baits but this fishery is winding down as water temperatures decline. The movement of striped bass from the northern states has not arrived yet but the vanguard of this southerly migration is due soon. Large baits of fresh menhaden or mullet will be in order and if one is surf casting this week it would be a good idea to at least give one heavy outfit a try. At the inlet and Route 50 Bridge area, fishing for tautog has been fun and exciting. Many of the fish are below the 16-inch minimum but there is plenty of action and enough legal fish to bring home dinner. Sand fleas and pieces of green crab have been the chosen baits. There are still a few flounder being caught in the channels leading to the inlet and the largest ones are being caught on finger mullet or Gulp baits. Bluefish keep darting in and out of the inlet at night and are being caught by drifting cut baits or casting Got-Cha lures or bucktails. Striped bass are being caught at the Route 90 Bridge area on a variety of jerkbaits and swimshads. 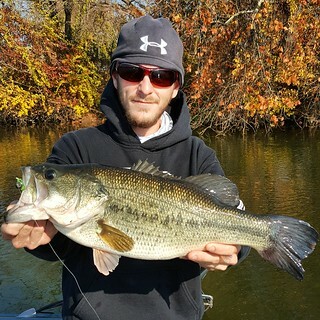 Although most are under the minimum size of 28 inches, every now and then anglers are rewarded with a large one. The same holds true at the inlet where casting bucktails, drifting live eels or cut bait has been accounting for some striped bass catches. Outside the inlet the sea bass action at the wreck and reef sites has been very good with limit catches being common. A mix of large flounder, triggerfish and bluefish are also being caught. 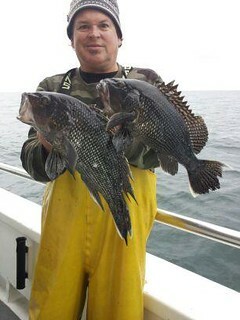 Those targeting tautog are making good catches at some of the offshore wreck sites. Some impressively large tautog have been coming into the docks at Ocean City this past week. 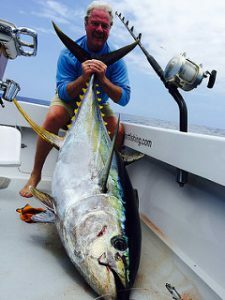 A few boats made it to the canyon areas when calm conditions prevailed and were rewarded with some outstanding catches of yellowfin tuna in the 50-pound-plus size category. Finding a stretch of warm water was the key to their success. Some exciting swordfish and bigeye tuna catches were also reported.